Home Achievers AED Club Volunteers at Project C.U.R.E. AED Club Volunteers at Project C.U.R.E. 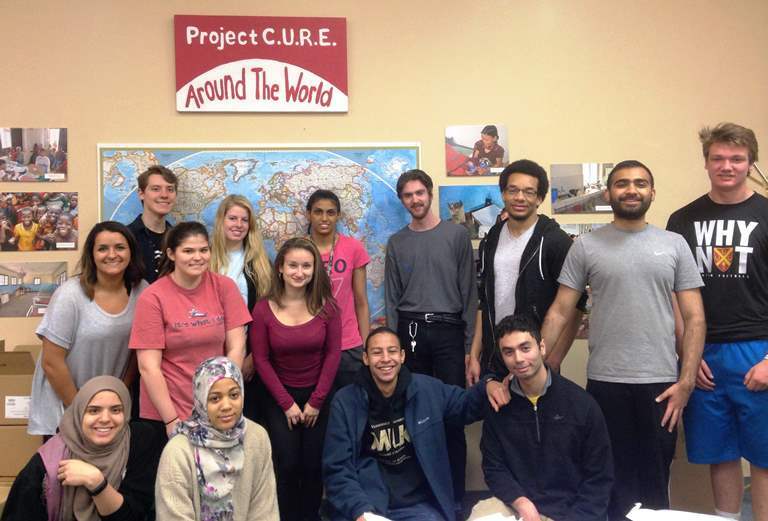 The Belmont Alpha Epsilon Delta Pre-Health Honor Society (AED) club recently volunteered at Project C.U.R.E. in Nashville. The group, made up for Belmont students Ambrose Rice, Jacob Curry, Hannah Forgani, Curtis Brown, Prisha Patel, Madeline Durham, Hope Fenton and Julia Quandt, teamed up with Vanderbilt’s MSA (Muslim Student Association) to prepare medical supplies for shipping to a small country in Africa. The group of students packaged over 100 boxes filled with supplies ranging from syringes and sterile gloves to general surgery supplies. With the help of volunteers, Project C.U.R.E. assists thousands of people in developing countries around the globe by sorting through donated medical supplies. Every country that receives medical supplies from the organization has their packages made especially for them after a Project C.U.R.E. leader has visited their hospital and assessed their needs, making each truck of supplies unique and based off each hospital’s current needs.